Densely populated Southern California is a highly competitive region for small machine shops. When bidding for new work, these businesses know that the competition is likely to be stiff. Always keeping an eye on the bottom line, many shops carefully consider any big equipment investments because they count on every dollar to compete with the guy down the street. At the same time, a challenge for many shops is being more efficient by reducing part setups in order to achieve faster turnaround and ultimately lower part costs, especially on repeat jobs. Axxis Corporation of Perris, Calif., was no stranger to this situation, but set its sights on improving flexibility and labor efficiencies to drive down part costs for its customers. This goal set Axxis on a journey to identify new solutions that could reduce setup hours, particularly in short cycle time applications. Axxis found it’s answer in 2014 with the purchase of a Makino a61nx horizontal machining center with a 12-pallet MMC2 pallet handling system. The system has given the company the flexibility to manage part quantities while achieving four times the production speed and three times tool life of its previous equipment. Axxis Corporation was established in 2007, after Brandy Tidball acquired an existing job shop that produced parts for the automotive aftermarket and energy, aerospace and medical-device markets. Tidball and his leadership team observed several opportunities for improvement within the shop that could drive down customer prices. After reorganizing the company and pursuing new business opportunities, Axxis Corporation knew it was time to focus on investing in new equipment in order to lower costs and improve service. “We thought that obtaining new high-performance equipment could improve efficiencies,” said David Butler, operations manager at Axxis. Axxis saw the opportunity to improve flexibility and grow the business by more efficiently managing a wide variety of part quantities and materials, including aluminum, stainless steel, carbon steel, plastics, high-temperature alloys and magnesium. 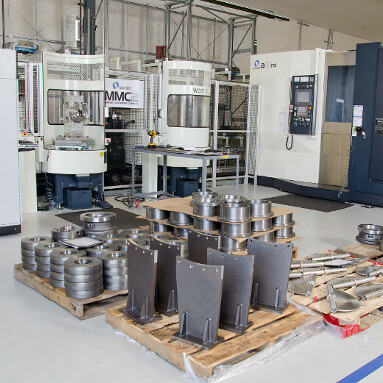 Axxis personnel initially looked for a high-performance, stand-alone horizontal machine with an envelope that would fit the company’s current parts. The goal was to consolidate operations, increase utilization rates and boost reliability. Axxis personnel were thorough in their research, talking to several distributors about HMC technologies and visiting many online forums to see which companies were being discussed. One of those distributors was Single Source Technologies (SST), a national distributor of machine tools, related consumables, tooling and EDM supplies. Colony introduced Axxis to another company using the same equipment. This customer had a flexible manufacturing system which included a horizontal machining center with an MMC2 automated pallet-handling system. While familiar with these flexible systems, the staff at Axxis had never seen one at work. 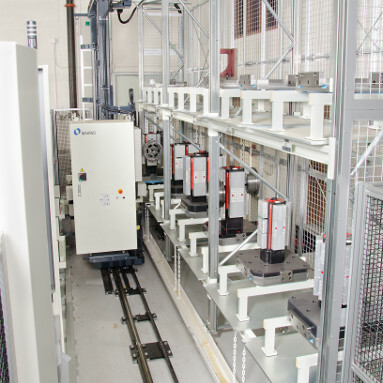 Axxis began exploring the potential of an automated horizontal machining cell with pallet system. The company’s next objective was identifying the best supplier to help Axxis meet its goals. 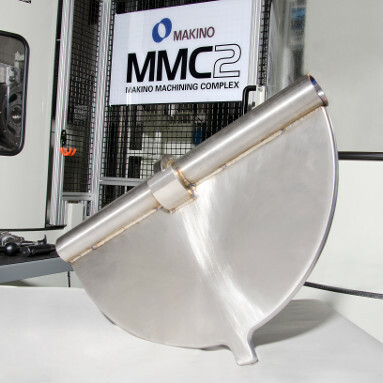 SST brought in specialists from Makino’s facility in Mason, Ohio, along with representatives from other vendors who would be supplying equipment. Together, they helped to answer the company’s questions and to discuss its needs. “SST made sure every question we had was answered, and not everyone did that,” said Butler. “They didn’t just say, ‘It will work’—they showed us how. They proved it. They rationalized how this equipment was not only affordable, but would support us in our mission to drive down costs for our customer. They also brought in representatives for tooling, probing and other kinds of equipment to answer questions and validate the capabilities of the equipment. Axxis purchased a Makino a61nx with 12-pallet MMC2 system in 2014. 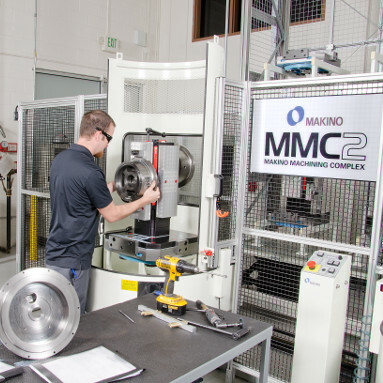 Prior to installation of the flexible manufacturing system, Axxis personnel attended training at Makino’s facility in Mason to learn how to optimize the cell’s machine and controls. “We thought we would be in a class with other companies, but were pleasantly surprised to learn that the training was tailored to our needs. We worked on a system that was identical to the one we had purchased, and Makino customized the software and taught us about the specific features we should be using. It made us feel completely comfortable with the cell’s MAS-A5 control system to use it on our own,” said Butler. During installation, SST was the single point of contact on all equipment, and Colony also coordinated ordering and setting all of the tombstones and vises. “The process was very streamlined,” said Butler. “We picked a configuration and they made it work. We had lots of people coming in and out, and SST took the brunt of the scheduling—communicating between all parties. There was great communication between those handling tasks such as the machine setup, tooling and probing. The project was achieved exactly how they [SST] explained it. Once everything was installed, Axxis began running parts without delay. And already, after just a couple of months of using the system, Axxis is loading its catalog of parts into the system and seeing positive results. The MMC2 has given the company the additional throughput it needed, along with workflow optimization. 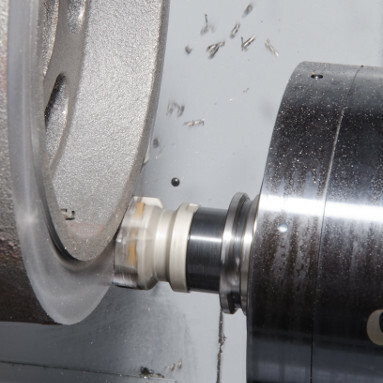 A significant portion of this timesaving is because the machining processes are no longer coupled to setup operations, so the spindle has virtually no downtime. “The control system allows us to store programs and fixture data for repeat orders, eliminating requirements for extended setup times,” said McClure. 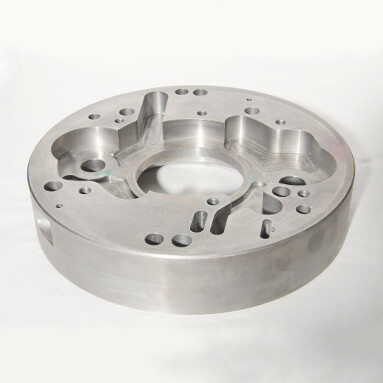 “With the increased spindle utilization, we achieve more parts and make our customers happy. Altogether, we are getting four times the overall productivity and four times the ROI compared to our previous equipment. Holding those tighter tolerances means accuracy has been improved. For example, one part used to require several mill operations and lathe operations. Now all operations are done on one machine in a single setup, reducing variation and holding necessary tolerances. In addition, parts can be checked and deburred while the machine is running. “As far as accuracy, we have a part where we need to hold tolerances of plus or minus 0.0005 inch. Our previous machines required four endmills per job to hold this tolerance. But we just completed the entire job with only one endmill on the a61nx due to the machine’s rigidity and through-spindle coolant, which flushes chips out of the part. These features allow us to achieve more high-speed cutting paths, really lowering our cost per part for customers,” McClure said. As it improved accuracy, the company also began to enhance processes with weekly management meetings to discuss its work in process. In addition, Axxis started using the system to collect data in order to improve any bottlenecks and increase throughput. “We were able to cut our work in process in half. We now have better visibility and flexibility in our production schedules, based on data collected by the MMC2 cell,” said McClure. The flexible manufacturing system has especially been a perfect solution for short-run, high-mix applications. With this flexibility, Axxis has seen organic growth in its current customer base and has also gained new customers as it looks to expand into the medical market. “Our shop motto is to look at the big picture so that we can continue to grow, and this equipment fits right in with that,” said Butler. Having achieved its goals for improving customer part costs and flexible delivery, Axxis is looking forward to eliminating overrun and reducing standing inventory as it continues to establish additional jobs in its cell. 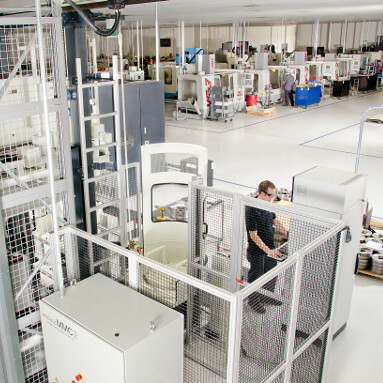 To achieve its goals, Axxis plans to further expand its flexible manufacturing system with 24 pallets and a second a61nx. It hopes to further improve its process by running parts overnight, doubling the business. Axxis’ initial interest in a stand-alone horizontal machining center was superseded upon witnessing the flexibility of an automated pallet handling system. One of the biggest advantages to Axxis’ investment in automation has been the elimination of redundant setups, enabling the company to improve lead times and overall profitability. Axxis’ investment in a Makino a61nx with MMC2 pallet handling system has enabled the company to eliminate concerns for reliability and downtime experienced previously with commodity machine tools. With the a61nx, Axxis is capable of holding tolerances of plus or minus 0.0005 inch repeatedly, while extending tool life three-fold. The enhanced rigidity, speed and power of the a61nx has enabled Axxis’ to perform more aggressive cutting processes, leading to a 50 percent reduction in cycle time. According to Axxis, installation of the MMC2 and a61nx was extremely thorough and prepared the company for quick and easy modular expansion in the future. The expanded tool magazine of the a61nx has provided Axxis with additional capacity for redundant tooling and the flexibility to run lights out operation.